Producer, composer, singer, engineer, and musician (not to mention a great dancer), J. Moss, released his long awaited album, “The J. Moss Project,” on October 12, 2004. Singles “I Wanna Be” and “We Must Praise” are already leaping up the charts and illustrate the diversity of this multi-talented gospel artist. Artists on-hand included Fred Hammond, Marvin Winans, Kierra “Kiki” Sheard, Karen Clark Sheard, PAJAM, Ramiyah, Bill and Essie Moss (J. Moss’ parents), Lexi, Vanessa Bell Armstrong, Jackie Clark, Sonnie Day, Brandon Perry (The Psalmist), Darius Twyman, and 21:03 (the latest gospel singing sensation from P.A.J.A.M.). Industry members there to support Detroit’s own included, Deborah Smith-Pollard (WJLB), Larry Robinson (God’s World), Walter Kearney (PAJAM), Paul Allen (PAJAM), Keisha Allen (Straight Gate Church), Carl B. Phillips (PraiseFest), Jamillah Muhammed (Mix 92.3), Michael J. Mindingall (Majestic Records) and the hard-working staff of Detroit Gospel.com. Lewis Gibbs, VP of the Word Network, was there with his crew video taping. The evening was hosted by Keisha Allen, wife of P.A.J.A.M. producer Paul Allen. One of the highlights of the evening was J. Moss’ mom, Evangelist Essie Moss, praying for J. and the guys of PAJAM. It was definitely a “family affair” as proud parents (Bill and Essie Moss), brothers, sisters, nieces, nephews, cousins (including Clark Sisters Jackie and Karen), wife, and sons came out in full force to support their own. PAJAM producers Paul Allen and Walter Kearney expressed their thanks for everyone’s support of PAJAM and presented roses to radio personalities Deborah Smith-Pollard and Rev. Mother (whose roses were accepted by Antia Birchette, Program & Music Director for 1340 AM, on behalf of Rev. Mother). The many who turned out for the celebration were treated to sets from Ramiyah, 21:03, and the man of the hour, J. Moss with his talented back-up singers (including J Moss’ niece) and band (which includes brother Bill Moss on keyboards). J. Moss demonstrated his musical versatility by going from fast paced songs like, “I Wanna Be” to the melodic praise and worship song, “We Must Praise”. 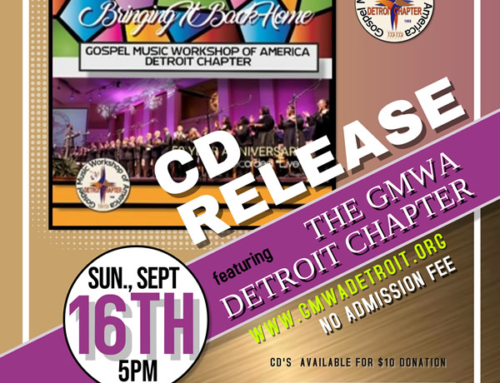 Detroit radio host, Deborah Smith Pollard, commented on listener reaction the first time she played, “We Must Praise” on her FM98 WJLB radio show, “Strong Inspirations.” One of the listeners was none other than Marvin Winans, broadcasting his own Sunday morning gospel radio show down the hall on FM 92 WMXD. Pastor Winans then turned right around a played “We Must Praise” on his radio show to rave reviews from his listeners.